In a second round match of tennis in the London Olympics 2012 Serbian Novak Djokovic and American Andy Roddick will face each other for their third round berth. "Long day today. Unfortunately, Viktor and I lost our match. We played our best, but the guys were just better than us. The good thing is that Janko and Ziki won, so we are still in the race for the medal in the doubles. Both Ana and Janko won their singles matches, and tomorrow is my turn to defend the national colors :) I play 3rd match on Centre court, and luckily for me this time there will be no rain delays. Wish me luck!" 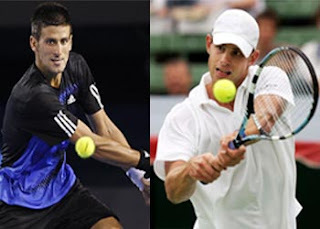 Let's see who guns down whom, seemingly Roddick has not been able to flash to the highest level in recent times, but he did win few small tournaments before coming to Olympics. The match will start at 1600 GMT live from the Centre Court .